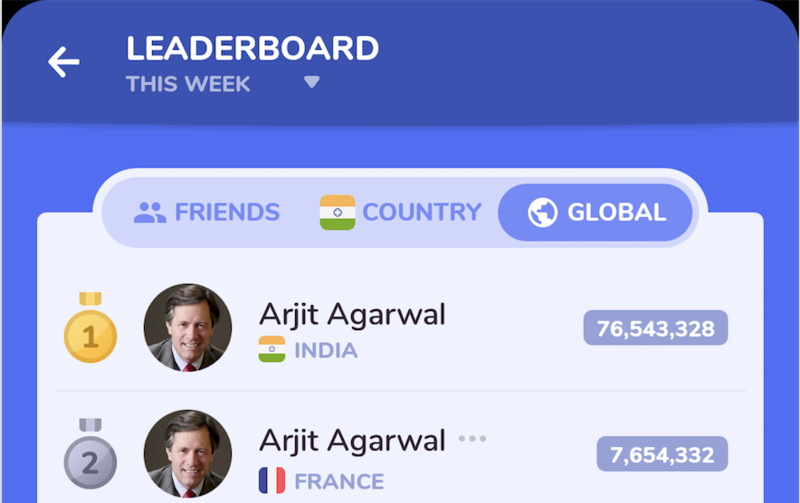 The app has multiple games and each game has its own leaderboards. The designer says that if there is only one element in the Spinner don't show dropdown and arrow and show dropdown and arrow only there are two or more elements. I don't think it is good from UX point of view. The logic is that a user may initially open game A which shows this spinner and the context is set that this screen have a selector on top. While, when he moves to game B where there is only one element he may think it as some kind of User Interface bug. The designer says that user would feel awkward if he sees one element only and realize there is nothing to select. I am not a designer. But, I feel my view is correct for few reasons. Once a designer told me UI controls should be consistent. That is why we use disabled states for buttons instead of making it invisible. With time user becomes familiar with the UI of the app especially with controls. Also, there is some general context with few things. For ex. A circular button with icon and shadow suggests that it is a clickable button. (Floating Action Button). If I don't show the arrow it happens to be a simple TextView, which doesn't sets the context of a selectable button destroying consistency of UI Control. I have seen in most of the apps, that Options Menu if having only one item is displayed as drop down. Even if we don't want to show drop down we must show arrow and some disabled state indicating that it is not selected. Still, I am not a designer and I want to clarify this. Hence, I put this question here. First: thanks for the info about spinners, this was new to me! To answer your question: I think you and your designer are both right in general but in this case i would display the spinner even if there is only one option available at this moment. Why? Because over time there will be more options available. To communicate this to the user you should display the currently unavailable options below the available options so the user understands whats going on. If there would be only one action permanently i would not display the spinner icon because this indicates "click here to view different option", if this is not happening the users will get unnecessary frustration. First, I think the "spinner" is not that pliant. In every instance, the user will be confused if she sees it. make it more "disabled" and make it more pliant when the feature is actually released. Another solution is to add a text in parentheses like "not available" next to the arrow-down, but it could increase the visual excise. My last proposition for that case is to display a toast which informed that this feature is not yet available when the user tries to click on the field. If you want to omit the arrow down, it's true that the user might be used not to see it and don't use it after, but this is also possible that the user actually notes the difference once the feature appears and is available to be used. All in all, there is no "right solution", just try it out. Make different mock ups with different options and ask people around you to get qualitative data (formative evaluation). You can ask which one they prefer or ask them to interact with them to see what happens. Well, I think your designer is correct about the design where if there is only one option then do not show drop-down. See the thing is we have to keep the interface as minimal as possible, good design is when there are no unnecessary elements. If there is only one option there is no use of drop down and the user will easily understand that I am getting the option of dropdown because there are more than one option available to me. In this case, the arrow in the disabled state only makes user feel like he has no access from some part of the app which is a negative effect. If we talk about consistency than if user has no option than why don't just text view work, by the end of the day it is going to look same if another option is never going to appear. For that particular question, you will have to provide me the context that how what kind of options are they and how often they change for a user. Not the answer you're looking for? Browse other questions tagged android dropdown android-ux or ask your own question. OK for dropdown button to be on the left? Dropdown select or Dropdown select + button? Should a dropdown need to click to close or simply stop hovering for x number of seconds?